The mule deer is an ever elusive trophy, and one that is sought by many hunters. These gorgeous animals have a gray coat with black markings on their forehead and white around their face. The bucks have antlers that typically grow up and out, branching toward the sky. In some states it can take years to draw a license to hunt one. Then it may take additional years to finally catch up to a record breaking one. Mule deer hunting is a challenge to say the least. The animals live in a variety of areas including above timberline in the Rocky Mountains, and down on the sage plains. They have outstanding vision and can spot your movement a mile away. They can smell you from more than 500 yards. In order to be successful on a trophy mule deer hunt, you need to be prepared. Scout - Having the time to scout your area prior to hunting season is ideal. Look for their tracks or a good game trail. Look for buck-level rubs on small trees. 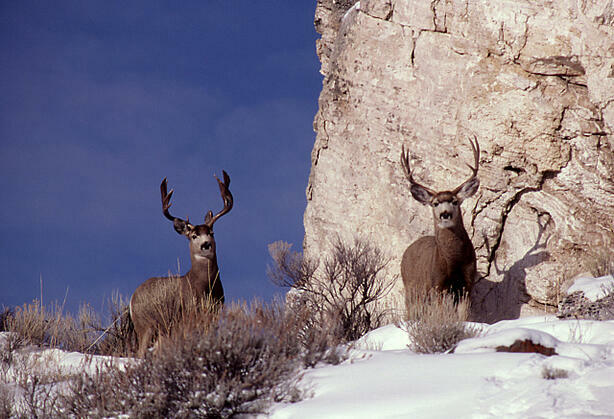 Mule deer and elk tend to live in similar areas. A rub high in the tree would more likely be from a bull elk than a mule deer buck. Make sure the sign you find is fresh and traffic is heavy so you are not wasting time hunting a barren area. Locate - The best way to locate the mule deer buck is with a spotting scope or binoculars. Make sure you have quality optics. Mule deer tend to move in the evening, middle of the night, and early morning hours, and they bed down during the day. Scan the oak brush and the tall grass for the white faces or the antlers. It is not often that you spot one right out in the open, but it can happen. When you are scanning a hillside, do so in a grid pattern, or as though you are doing a word-search puzzle. Scan left to right and up and down looking for not just a deer, but parts of a deer. 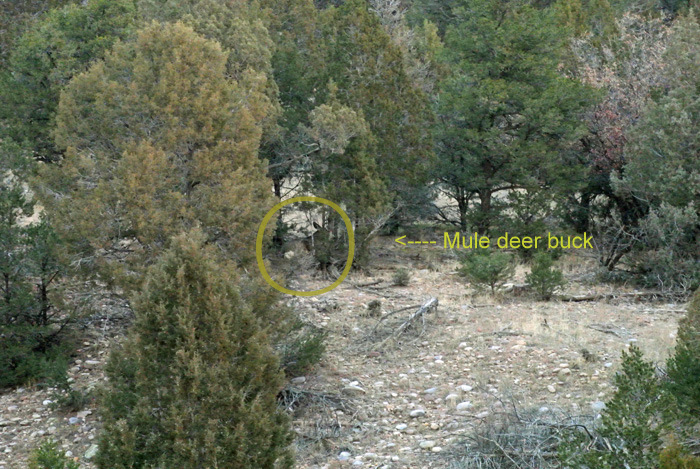 Look for antlers, legs, tails or just the gray shade of a mule deer’s fur. Often times a buck conceals himself so well in the brush that you will scan past him several times without taking notice. Proper Gear - You may be glassing across rugged mountain valleys, rolling hills or through cactus and sage brush. Either way, once you locate your buck, you will generally have a stalk on your hands. Be prepared to go to him, as he generally will not come to you. Be in shape and have good quality shoes for the hike. Wear gear that is durable and will remain quiet when walking or crawling through brush. Take your time - Go slow when you make your stalk. Avoid sudden movement. Stick to trees and brush for concealment. A mule deer cannot distinguish colors very well, but they easily detect movement. Be sure to freeze behind the trees or brush when he is looking your direction. Wind direction - Always play the wind. Stay down wind so his keen nose does not alert him that you are getting near. According to the Mule Deer Foundation, a buck can catch your scent as far as a half mile away. It can take years to finally catch a record-breaking buck, but the hunt is very rewarding. Keep after him and eventually you will earn your prize.